It is not an unknown fact that finding a job is no easy task, in this present economic condition. However, once you have received a job offer, it is important to ask yourself a few questions as well as weigh and measure a few things. You should never take up a job unless you are entirely sure about it, as if you suddenly leave the company then you are bound to create a bad impression for yourself and rumors like this travel very fast in the business world. So do make it a point to ask yourself these vital and pointed questions before accepting a job offer. 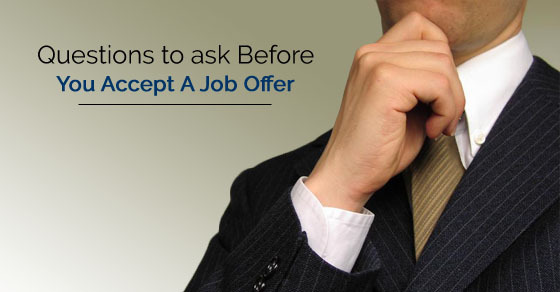 The following mentioned are a few questions to ask employers before acceptance of job offer. 1. Is the company a reputed one? When accepting a job offer it is important that you do a little background check on the company and ensure that the company has a good name. Would you really be interested in joining a company which you will be too embarrassed off mentioning in your CV? There is no harm in working for a promising startup but ensure that you do not become a part of a shady company that could go on to tarnish your entire reputation in the business world. A reputation once tarnished is tough to build up again. 2. Will the salary help me to cover all my expenditures? Though this question might seem a little mercantile yet it is important that you face reality and go ahead and ask yourself this vital question. However, what you must realize is that if the company is really good and you are mainly joining for the experience and exposure rather than the money then you should not be too bothered. Money is something that will come and go but the experience is something that can never be bought. Starting out from the bottom isn’t a bad thing, you should constantly try your best to keep your face to the sunshine and eyes on the goal. 3. Is the salary too little as opposed to the tasks I have to manage? No matter how eager you are for the job, never accept a job offer where you will be overworked and consequently underpaid. A company which really values its employees will go to any length to keep them happy. So maybe you should pass on the job if you find that in proportion to the work which they are going to make you do, the salary is practically unfair. You should never be one of those people who sit quietly when something unjust is happening. If the company is willing to negotiate upon the salary then that is permissible. 4. Is the work environment good or bad? Though it is never possible to know about the company’s work environment unless you actually experience it for yourself, yet in such a case, if you want to know about how the company work environment is, then you have to go right ahead and ask an employee who has been around for a significant period of time. He or she is bound to advice you and tell you exactly what you should do. You should take into account all that is said and decide whether or not, things sound okay as well as acceptable to you. 5. Am I merely settling because I’m in desperate need of a job? No matter how desperate you are for a job, you have to ensure that you are not merely settling for something. It is often quoted, that a bird in the hand is worth two in the bush, yet settling for something which is way beneath your ability is something that is absolutely unacceptable. When you choose to work in a company that is right for you, then you will automatically feel excited on the inside. If you are not getting this feeling of happiness and excitement then this is a job which you ought not to accept. 6. Is this better than the job I have at present? If you are someone who already has a job but have received a job offer from another company, then taking a decision becomes all the more complex. You have to take out some time alone and carefully weigh out all the pros and cons of leaving your old job and accepting the new one. You should take your time to make this important decision and if you feel that you need to, then you should consult your friends and family and ask them what they think that you ought to do given the situation. 7. Am I likely to get a better job soon? One of the worst things which you can do is, pass on a job and then realize that there is nothing else coming your way in the near or distant future. Sometimes what you must remember is that it is okay to simply take up the job for the sheer experience so that you stay in touch with things in the business world. If you take a long sabbatical then you might never have the confidence to make a return into the business world again. So make it a point to make no rash decisions based on what others tell you to do. 8. Is there scope for me to rise in this company? What you must never do is join a company where you know that there isn’t much scope at all for you to rise. If you join a company where you already have nothing more to achieve then this is something that might take a toll on you psychologically. If people have no goals to work towards then they often become cynical. So ensure that you join a company where you have unlimited opportunities open before you and where the world is your oyster. Making wise choices will reap rich benefits for you. 9. Is the management of the company corrupt? In order to find out about this question, it is vital that you need to ask around someone who currently is a part of the company or even someone who was a part of the company and left for some reason or the other. You should never make the mistake of joining a company which is corrupt and where promotions are made on the basis of favoritism. A company which has a corrupt management will never be able to be successful and it is only a matter of time when such a company will have to close its doors and shut down. 10. Can I see myself working here ten years from now? Another important question to ask prospective employer, which you have to consider when joining a company is whether or not you would like to join this company as a temporary thing or as a long term job. Though not many people have an answer to such a question before they join the company, yet you should keep in mind this question and whether or not joining this company will help you achieve the career dreams which you have for yourself. Sometimes merely taking the plunge is advisable as you can never really chalk out your life entirely. 11. What are the perks that they are going to be offering me? It is important that you make a very informed choice when you decide to join a company, so keeping this in mind you should ensure that the company is offering you the perks which someone in your position ought to be receiving. Perks include things like housing facility, health insurance for you and your family as well as other things. If you realize that the company isn’t even offering you these basic perks then maybe it is right that you wait for something better to come along as in these day and age such perks and benefits are offered to all employees in good companies. 12. How far is my office from work? Though this might seem like a very irrelevant question to ask before accepting a job, yet it is indeed something very vital to consider when deciding whether or not you should accept a job offer. It is always advisable to opt for a job where the office is not too far from your residence. You most certainly would not want to be burning a hole in your pocket spending a great amount of your money on conveyance and neither would you want to spend a lot of your precious time on the bus or in the cab. Thinking along these practical lines is important. 13. Can they fire me at will? It is not a good choice of accepting job offer letter, which is undependable and where the management can tell you to pack your bags at any given point in time. Sometimes having some job security is something that can really bring out the best in you and give you the courage and conviction to take some risks. However, having a stable job does not imply that you begin to take things lightly and become relax in the quality of work which you submit to your seniors as well as a manager. Having a good work ethic is something that will take you very far indeed. 14. Even if the salary is fine, is the position to low? As mentioned above having a good salary is important, yet you must consider that even if the salary is sufficient, is the designation too low? If you are qualified for a particular position then you should not be willing to accept something which is way below. If you do not respect yourself and are just a ‘yes’ man, then people are sure to take advantage of you. If you think that you are not being given your fair dues then bring it to the notice of the company and even ask if they will be willing to alter the offer which they have made to you. 15. Are the work hours much too erratic? When you are young, working round the clock might not be too hard, however trying to live your life like this isn’t a very healthy thing to do. So before you accept a job offer which has happened to come your way you should ensure that you check whether the work hours are okay and whether you will be willing to devote so much of your time to the job. 16. Will I be expected to work from home on holidays? There are some questions to ask about a job, which you need to keep in mind and ask the recruiter as soon as you can. Things like this should be sorted out right from the onset so that you can make your decision in an informed manner. 17. Is the job out of my comfort zone or something which I have been trained to do? Finally you should address the issue of whether the job being offered to you is something which you have never tried your hand at before or whether it is something which you have been used to doing all your life. Even if it is something new, you should not shy away from trying things out. They would not have made you the offer if they didn’t think you were capable. So the above mentioned are few points on how to accept a job offer and negotiating job offer. Once you have asked yourself these questions make it a point to take note of all the answers. If your answers are all negative then you know that maybe this is not the job for you. Though money is important to survive yet it should not be the only thing which you keep in mind when taking up a job. Living a balanced life is absolutely imperative otherwise when you are old and grey, you will realize that though you have a lot of money and savings, yet you have not made any memories and neither have you been able to ever enjoyed the money which you have worked so endlessly to make. Next articleHow to Write a Resume Skills and Experience Section?